The Marquis at Trillium Park offers independent apartment living in a community of fun and friendship. Residents can come and go as they please knowing that professional staff members—some who also call The Marquis their home, are always available to provide as much or as little support as one requires. An intimate, eight-storey building, The Marquis offers a wide array of accommodations and amenities. Available are one- and two- bedroom apartments—ideal for couples, as well as comfortable bachelor suites. A newly renovated pool with steps, landscaped patio area, gazebo, and barbeque surrounded by a privacy fence is a relaxing place for residents to gather, soak up the sun and enjoy a refreshing dip. Located in the beautiful, established Trillium Park community in Sarnia, The Marquis is a warm, welcoming environment close to shopping, medical centres, parks and public transportation. A continental breakfast is served daily in our Activity Room, and buffet-style lunches and gourmet dinners are served in the dining room where friends and neighbours gather to share meals and daily stories. Guests and family members are always welcome at The Marquis dinner table. 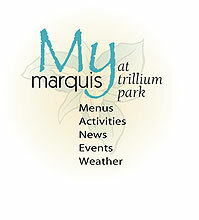 To see a sample menu, visit My Marquis at Trillium Park. In addition to activities such as crafts, movies, games, and exercise programs planned at The Marquis by our Activities Director, we make an effort to provide opportunities for residents to enjoy all their community has to offer. Our van service is available for outings and errands three times a week. For a look at a sample activity schedule, visit My Marquis at Trillium Park. Come and see what The Marquis at Trillium Park has to offer. To organize a personal tour, or to find out more, contact us today!